Unlock the very best Vietnam has to offer on a scooter-led adventure from the south of the country to the north. In Vietnam it’s law that every motorcyclist wears a helmet; it matters little that the flimsy plastic variety favoured by locals have all the protective attributes of a baseball cap. It would appear, however, that there are no laws against carrying unrestrained pigs in front baskets of scooters; or balancing up to four passengers on a single bike; or letting children as young as 12 take control of a vehicle. Like it or not, hiring a scooter is the best way to see Vietnam. 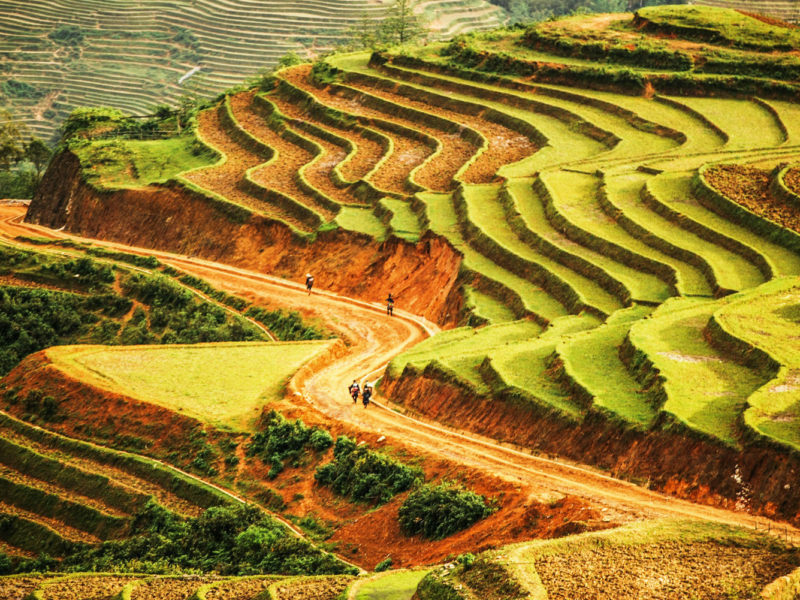 Lonely Planet calls Vietnam “an outrageously fun country to explore” – and perhaps it’s Vietnam’s greatest attribute that exploring here is easy – travellers need not trek far to find themselves well off the beaten track. And that track is getting beaten down fast: Australians are embracing Vietnam in record numbers. If you don’t hire a scooter, you may find yourself elbow to elbow with the rest of your fellow countrymen. I arrive in Saigon with no itinerary – just an international driver’s licence – I plan instead to rely on nothing but the travel tips of locals and fellow travellers. The island of Phu Quoc garners all my attention on my first night in Saigon. Travellers throw its name around like it’s the real-life incarnation of Alex Garland’s mythical utopia in The Beach. “It’s Phuket 40 years ago,” a French traveller tells me. “It’s quiet, not so many backpackers; just beaches, monkeys, fishermen.” At 45 minutes flying time (costing from $156) from Saigon, it seems a good place to start. The Vietnamese government, apparently, has been touting Phu Quoc as the next Phuket for years, but Phu Quoc is still best known for producing Vietnam’s tastiest fish sauce. Fifty percent of the island is national park; many of the island’s roads are yet to be paved. It’s very quiet too – strange considering how close it is to Vietnam’s largest metropolis Saigon. Yes, Phu Quoc seems the perfect place to begin my scooter odyssey. I hire a scooter in Phu Quoc’s biggest town, Duong Dong, and throttle back nervously, joining a procession of bikes, immediately locked in every direction. Duong Dong isn’t big, but it’s busy and I’m forced to cross three lanes of traffic to make my way onto a road that slices Phu Quoc up the middle. A car stops suddenly in front of me and I narrowly avoid sliding on the slippery gravel, but an hour later I make it to the dense jungle of the coast motoring up to the island’s remote north-east corner. Vietnam’s best beach, I’m told, is at the end of a dirt track around here. I see a handwritten turn-off for Bai Thom and amble down a path with pot-holes the size of bomb craters. Goats wander across the road and small children appear suddenly out of the forest; then I see it – a wide, sandy beach ringed by coconut trees with a few tiny beach-side bars. It’s prettier than any beach I’ve seen in Thailand, but without the backpackers. Each day I ride further around Phu Quoc’s mostly empty coastline. Some days I venture into its highlands, hiking its tallest peak, Mt Chua, before returning each evening to a bungalow on Long Beach. There are numerous options all along the beach here only a few minutes ride from Duong Dong – the ones I try all are humble affairs but have verandahs with hammocks that look out across the South China Sea. At night there are a few options for dinner near my hotel on Long Beach; there’s nothing better than chilled beers and cheap seafood at the beach-side bars and restaurants. I try a different bar and restaurant each night, but find a simple consistency to all of them: chairs set into the sand, a surprisingly long menu of seafood dishes, and staff who seem too chilled even to leave their seats to take your order. Although the bars here remind me of Koh Samui, they lack the R&B throb, the good-time girls and crimson-faced backpackers. When I begrudgingly leave Phu Quoc, I share a cab to the airport with two French travellers who insist I visit Dalat, a mountain retreat 300 kilometres north of Saigon. So, at six the next morning, I arrive in Dalat. I step off my overnight bus from Saigon into bitter 14-degree weather, wearing only a t-shirt. French colonists dubbed Dalat the Alps of Vietnam and came here to escape the monotonous humidity of the coast (which stays a pleasant 15-24 degrees year-round). Dotted with French colonial architecture and fringed by farms of strawberries, vegetables and flowers, its streetscape is dominated by bohemian cafés and bustling produce markets. But Dalat’s magic is in its surroundings: huge lakes and waterfalls surrounded by thick forests and endless farming land. I drive towards the best known waterfall, Elephant Falls – 30 kilometres west, past vegetable plots tended by armies of local workers in conical palm hats. Winding my way round hair-pin corners on narrow bitumen roads I witness a landscape of lush green plantations ploughed by water buffalo. As I ride entire families pass me on scooters, balancing cumbersome farming equipment across their handlebars. Further out (45 kilometres from Dalat) I travel to Pongour Waterfall, said to be the most beautiful waterfall in the entire south of Vietnam – although I find Prenn Waterfall, just 10 kilometres from Dalat equally as pretty, cascading as it does down to a small valley of flowers and pines. When I’m hungry on the road, I stop at dirt-cheap roadside stalls and order the local delicacy Pho (noodle soup) while small children stare at me and giggle as if they’re not sure I’m real. Mornings become my favourite time in Dalat; they’re always blue, cool and crispy, and the town’s French ties mean the croissants and coffee are as good as anything you’ll find in Vietnam. In my favourite café, the Chocolate Café, the manager Nguyen tells me to ride further afield along Vietnam’s most picturesque roadway – the mountain pass down from Dalat to Nha Trang – a 130 kilometre or so rollercoaster-like track. Taking his tip, I ride off across the Central Highlands, past roadside waterfalls and beside national parks. Some corners of the road are so tight I fear my brakes may burn out, and low cloud blocks out my view of the road entirely at times. Buses overtake me on blind corners, whilst logging trucks ignore the panic in my eyes. But don’t worry too much, there are safer alternatives. You can ride on the back with Dalat’s Easy Riders – bikies who carry passengers throughout this part of Vietnam. There are also sections of the road you can mountain bike down with adventure companies such as Phat Tire Ventures. After a day of slow riding (and hitching a ride on the back of a truck for the last leg) I make it to Nha Trang. Opting to stay out of this resort metropolis – whose streetscape on first glance reminds me of a lower-end version of Queensland’s Gold Coast – I instead take an overnight bus north to Hoi An, a World-Heritage listed town half way up Vietnam’s eastern coastline. After the seclusion of Phu Quoc and Dalat, the mass of Australian travellers in Hoi An shocks my senses and takes away some of the romanticism of travelling blindly through Vietnam. It is a stunning town – when its streets are lit up by silk lanterns, Hoi An’s Old Town looks like an Asian fairy-tale – but it’s dominated by touts spruiking tailored suits and westerners bargaining with them, and for a moment. I feel as if I’ve skipped borders into another country entirely. But, I soon find solace on a scooter making my way north towards Danang turning off onto a dirt track that leads to a coastline of empty beaches (but turn before you hit the sprawling multi-conglomerate golf resorts just south of Danang). I find a beach entirely to myself, which appears to have no name at all. Empty no-name beaches like this are still easy to find along Vietnam’s sprawling east coast. If you take any turn off the main highway to Danang, you’ll be sure to soon find an empty beach at the end of a deserted track. At some beaches you’ll find rustic beachside bars serving cheap, fresh seafood. The bartender at one tells me I’m the only westerner who’s come in a month. But then Vietnam’s like that, even in the backpacker district of Saigon – Pham Ngu Lao – all it takes is a five-minute walk across a main road to find streets where neighbourhoods of locals come out just to watch you eat. Courtesy of my wheels, I travel further north to Vietnam’s capital, Hanoi. Hanoi’s picturesque Old Quarter is well worth lingering in, but it’s dominated by backpacker joints, water puppet shows and hawkers peddling cheap t-shirts and sunglasses. But, by waking with the dawn and riding up and down the city’s regal, cathedral-like boulevards before the streets become booby-trapped with a million bikes, I avoid other travellers entirely. If you leave early enough, it’s possible to escape the hustle and bustle of the city and find traditional, peaceful towns just a couple of hours drive away. Two hours ride north-west of the city, I spend two days in the forest-covered mountains of Tam Dao, hiking through thick forest in the same cooler temperatures I relished in Dalat. Then I ride another 50 kilometres west to the beautiful soaring valley villages around Mai Chau, where local farmers tend methodically to paddy fields. Here I stay with a local family in a stilt house three metres above the ground. While Mai Chau is hardly a secret (because of its proximity to Hanoi) it’s easy to escape into the tranquil farmland where the White Thai ethnic minority live – they live a fairly traditional existence, far from the tourist buses that arrive most days from Hanoi. According to the National Administration of Tourism, Vietnam anticipates to receive a whopping 10 to 15 million tourists per year by 2020. Perhaps then it will begin to lose its innocence and the ease in which visitors can explore a country well beyond its new beach resorts and the cheap cocktails that come at happy hour prices every sunset. Till that time, all it takes is a set of scooter wheels – oh, and a plastic helmet. Vietnam’s climate is very diverse, but overall it’s best to go between March and May and from September to October. If you’re going only to the south, November to February is best. July and August is high season and can get very busy. The Night Markets at Duong Dong serve the freshest seafood in Phu Quoc. Located on the road into Duong Dong from Long Beach (you can’t miss them). They have over 20 stalls serving barbecued seafood. A lengthy visit to one of Vietnam’s best markets – Ben Thanh Markets in central Saigon. Sure, it’s not all pretty (there’s plenty of blood and guts baking in the sun) but it’s the best insight into local life that you’ll get in Saigon – and some great bargains too. The people – even hawkers operate with an innocence and charisma you won’t find in many other Asian countries. Vietnamese people are gregarious, they love a chat and a drink – it’s easy to make friends. As Vietnam becomes more popular, ‘progress’ is changing the landscape. Particularly in Nha Trang and Danang huge resorts are becoming a blight on the scenery. Scooters are available from just about anywhere in Vietnam – hotels, backpackers, travel agents, petrol stations, you name it. Make sure you have an International Driver’s Licence and travel insurance that covers you for riding a scooter. The local currency is the Dong, ATMs are available in all tourist areas but bring plenty of cash with you if you’re going to rural areas – USD is also accepted in the major cities. The Vietnamese expect you to bargain, but don’t get as precious about it as you might in Thailand. Vietnam is a relatively safe country, but be aware of thieves, particularly in tourist areas and big cities. Violent robbery is very rare. Malaria is rare but be aware of Dengue Fever outbreaks and cover up against mosquitos. This is a great article about travelling in Vietnam. For those who want to ride in Vietnam, I suggest to check out the road rules (practical and informal but work well). I’ve been riding for years in Vietnam and know the rules are very important. This covers more of the South than the North Vietnam. To add: It’s more flat in the South and The North is better with roads, views, people and customs. Scooters have hair trigger accelerations and riding slow is the key. Allow longer braking distance and wear a good crash helmet and safety riding gear. These scooters are good for cities and short distance trips. But you claim a international drivers license will suffice? It’s nice story! This must be helpful for the ones planning to visit Vietnam. 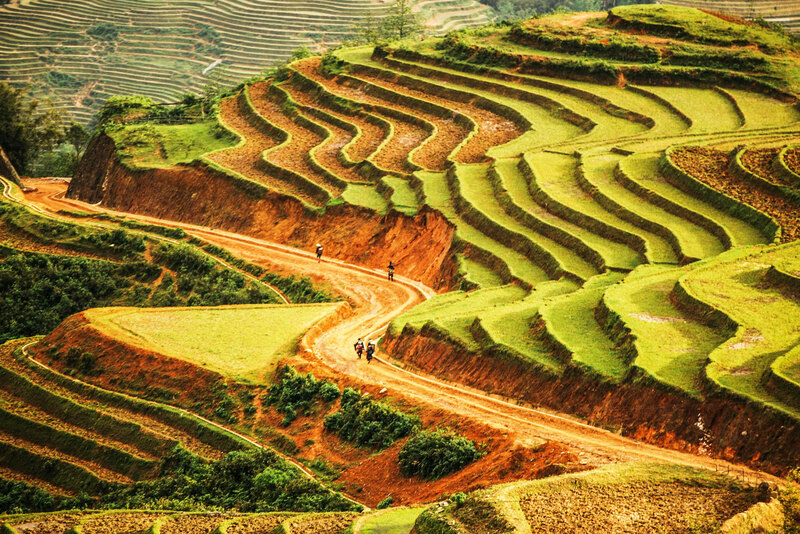 For travelers who are more keen on a challenging road trip, riding a scooter in the Northern part of Vietnam where zigzag mountainous trails dominate might pique your interest. I’d suggest a scooter ride from Hanoi to Ha Giang or Ba Be – Ban Gioc. The landscapes there are just awe-inspiring!